NEXT STOP IS eastern Africa two and half million years ago—Act II of the human journey. Our arrival coincides with the dawn of the Pleistocene Epoch . An initial scan of the landscape reveals another mosaic of grass and woodlands not so unlike Ardi’s homeland. The expected array of big mammals is here: monkeys, pigs, antelopes, horses, rhinos, hippos, elephants, and carnivores. Like the modern Serengeti, horned antelope are particularly plentiful and diverse. Wildebeest and impala roam the plains in great numbers. Gazelles bound in and out of woodland patches. Waterbuck frequent the thick scrub adorning lake margins. Yet slowly you realize that something is profoundly different. The proportion of grasslands has increased at the expense of forests, and many of the mammals are mega-sized. There’s Elephas recki, a giant elephant far exceeding the bulk of the present day African elephant (Loxodonta). Also present are ultra-big baboons, wildebeest, and pigs, among others. Together with extra body bulk, all of these plant-eating mammals possess beefed up jaw muscles and broad, high-crowned cheek teeth covered in thick enamel. This trio of traits—enlarged bodies, molars, and jaw musculature—represents a convergent evolutionary response to the same dietary challenge. Food in grassland settings is dominated by tough, fiber-filled, low quality offerings. Many animals here, like Elephas and wildebeest, are consumers of grass. For others, like pigs and baboons, the menu consists mostly of tough fruits, hard seeds, and underground tubers. Either way, oversized cheek teeth driven by big chewing muscles offer a first line of defense. Big bodies with enlarged guts are the second line, digesting high volumes of low-nutrition fodder. apparatus was well suited to a diet of coarse plants, tubers, and other hard foods. Although her appearance is strange, you can’t help but feel a certain kinship toward this bantam-sized creature. several smaller hominins have retreated to the tree, using their long arms to move through the branches with great dexterity. The unfortunate wildebeest, perhaps the victim of a lion kill, has been dead for at least a day and apparently dragged to this location. The hominins are clearly excited to be feeding on meat, yet anxious to move on. In a world of lions, leopards, sabertooths, and hyenas, hit and run is the only viable strategy for a runty scavenger. The scavenger in question is Australopithecus garhi . Australopiths were a hyper-successful group of hominins that persisted throughout most of Africa for well over 2 million years. The oldest known example, from about 4 million years ago, is Australopithecus anamensis, a species that heralds the onset of Act II. 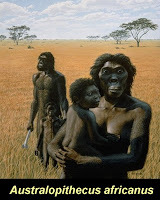 Then comes afarensis (Lucy), africanus, garhi, and sediba, the last of which disappears about 1.75 million years ago. This sequence does not denote a straight line of ancestors and descendents. Several of these species overlapped in time. Some lived in southern Africa whereas others are known only from East Africa. If the pace of recent finds is any guide, additional kinds of australopiths await discovery in African sediments. The skeletons of Australopithecus and Paranthropus are closely similar in both size and shape— an arm bone or vertebra of one could easily be confused with that of the other. Their brains were similarly sized as well. But australopith skulls lack the swollen cheeks, massive molars, and large, muscled crests of Paranthropus. Early Australopithecus species such as Lucy’s tribe are thought to have consumed a mixed diet of fruit, seeds, and wild vegetables, though studies of microscopic tooth wear suggest that this diet was augmented with occasional hard foods. Later australopiths, including our raucous toolmaker, Australopithecus garhi, appear to have developed a taste for meat. In fact, garhi is arguably the first hominin to embark on a technological adventure that would one day result in electron microscopes, 747s, and iPads. The earliest evidence of stone tools dates to about 2.6 million years ago. For a long time it was thought that these crude blades, scrapers, and hammers—referred to collectively as the “Oldowan” tradition—must have been made by early members of our own, big-brained genus: Homo. The oldest known representative, Homo habilis (“handy man”), had a respectable brain size of 600 cc, a substantial gain over the 450 cc of gray matter housed in the noggin of Australopithecus garhi. 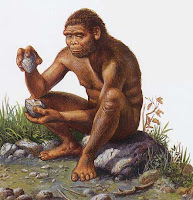 The embarrassing problem is that the habilis remains date back only as far as 2.4 million years ago, resulting in a 200,000-year hiatus between the first stone tools and the first Homo. Of course, we could simply be missing the earliest Homo fossils, but, by the same logic, we may be missing even earlier stone tools. Adding fuel to the controversy is the fact that garhi remains were found in close association with a 2.5 million-year old butchery site, in which antelope and horse bones show distinctive cut marks. Slices on a zebra jawbone demonstrate that at least one of the tool-users was going after the tongue. So perhaps big brains weren’t necessary to launch this technological revolution. My guess is that the stick- and hammer-wielding chimps in the present-day forests of West Africa wouldn't be surprised. It’s difficult to overstate the evolutionary significance of Oldowan stone tools. Think of them as multi-use, replaceable teeth—external dentures perhaps—that gave hominins access to a range of previously inaccessible (or at least rarely acquired) foods, from hard-shelled nuts to meat and marrow. Whereas genetic evolution can require millions of years to craft a thick-crowned molar or slicing canine, our ancestors learned to modify quartz and lava into a modest array of tools. Hit one chunk of basalt against another and the slicing blade that flies off is likely to have a sharper edge than the most lethal canine. The larger rock with a piece missing can be used for crushing, chopping, grinding, or generating more blades. In effect, tooth-mimicking tools enabled hominins to escape the limits of their own dentitions and begin the process of digestion outside the body. Best of all, this newly acquired technological capacity could be passed, gene-like, from generation to generation. fatty acids fueled the initial brain expansion in our Homo lineage . Coincidentally, it was within a few hundred thousand years of the earliest stone tools that the first major leap in brain size occurred. Finally, stone tools conferred upon early hominins a large measure of flexibility in the face of change. Plants counter the efforts of plant-eaters through a variety of evolutionary “strategies,” from hard outer coverings to chemical toxins. When shifting African climates transformed plant communities in a given area, it would have required significant time and effort for resident hominins to determine which of the new varieties were palatable, and how their nutrients could be extracted. Yet, barring a major deterioration in ecological conditions, chances are that carcasses of large herbivores would still occur on the landscape. So as long as opportunistic scavengers had their stone toolkits handy, they could probably eke out a living. Towards the end of Act II, evolution’s creativity generated a bevy of hominins. One of these was bigger brained Homo habilis, the aforementioned “handy man.” Arguably the first representative of our own genus, habilis was not much larger than an australopith. At present, Australopithecus garhi is a plausible candidate ancestor for Homo habilis, but any such conclusion is provisional at best . Despite our continual emphasis on the importance of brain size, there’s no evidence that the initial appearance of a larger-brained hominin was an ecological “game-changer.” Homo habilis did not immediately utilize its heightened neuron-power to conquer all foes and emerge as the dominant “ape-man.” On the contrary, the waning scenes of Act II witnessed the greatest known florescence of hominins, with up to six co-existing species in Africa around 2 million years ago. Other than habilis, the hominin menagerie included two kinds of Australopithecus (sediba and africanus), two of Paranthropus (boisei and robustus), and a last minute walk-on—the thick-browed, lanky-limbed Homo erectus. As we shall see, erectus would turn out to have greater staying power than any other hominin, rising to become a major star of Act III. 5. The Pleistocene Epoch is now recognized to extend from 2.6 million years ago until 12,000 years ago. Up until 2009, this time period was said to begin at 1.8 million years ago, so any sources older than this will regard the 800,000 year period from 2.6 million to 1.8 million as part of the preceding Pliocene Epoch. 6. Asfaw, B., White, T., Lovejoy, O., Latimer, B., Simpson, S., Suwa, G. 1999. Australopithecus garhi: a new species of early hominid from Ethiopia. Science, 284(5414):629–35; De Heinzelin, J., Clark, J. D. White, T., Hart, W., Renne, P., Woldegabriel, G., Beyene, Y., Vrba, E. 1999. Environment and behavior of 2.5-million-year-old Bouri hominids. Science, 284(5414): 625–9. 7. Cordain, L., Watkins, B. A., and Mann, N. J. 2001. Fatty acid composition and energy density of foods available to African hominids. Pp. 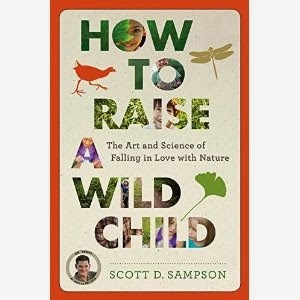 144-161 in A. P. Simopoulos, K. N. Pavlou (eds. ), Nutrition and Fitness: Metabolic Studies in Health and Disease. World Review of Nutrition and Dietetics, Vol. 90. Karger, Basel. 8. 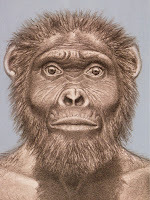 Currently, Australopithecus garhi appears just prior to Homo habilis and makes a plausible ancestor to the genus Homo. However, given such a bushy hominin family tree, identifying ancestors and descendents has become a high-risk sport, with another imminent discovery likely to blow the latest hypothesis to smithereens. So paleontologists don’t put too much weight in such claims.